Registering is easy. Simply go to the Working Advantage website and sign-up to become a member. Using the Member ID 333042079, you may complete your one-time registration for free and create your own personal account with a password of your choice. Getting ready to travel for business or pleasure? Check out Working Advantage discounts on hotels. You can receive a discount of up to 60% off at select local hotels in major cities. Some of the featured cities include: Paris, New York, London, San Francisco, Las Vegas, Chicago, and Rome. Why book with Working Advantage? Why not! With your alumni benefits you receive the lowest price, advance booking savings and last minute deals. Keiser University also has corporate discounts of up to 25% off at 25 select hotels in 19 cities from Miami to Nashville. These corporate discount partners include: Hampton Inn, Sheraton, Holiday Inn, Courtyard Marriott, and many others. To inquire about the latest negotiated rates, please call MRG Travel at (954) 489-2940 or email MRG@keiseruniversity.edu. Need a rental car at your final destination? Save up to 25% nationwide on rental cars. You can rent from the following great companies: Alamo, National, Enterprise, Avis, Budget and Hertz, which is one more reason to take advantage of your Alumni Association benefits. Want to have a little fun while on vacation? 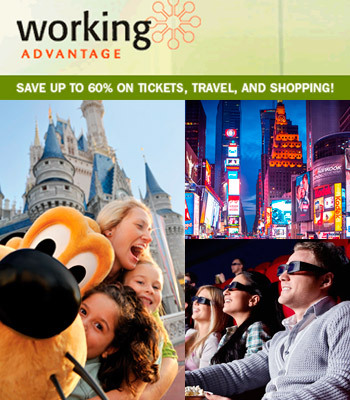 With Working Advantage you will receive exclusive discounts on theme park tickets. Theme parks include: Walt Disney World, Disneyland, Universal Orlando, Universal Hollywood, SeaWorld, Six Flags, Bush Gardens, Discovery Cove, Legoland, Sesame Place, Knotts Berry Farm, Hershey Park and many more… Another example of your Alumni Association working for you!